Evaluation: Small but crafty and extremely skilled scoring guard. Wells is a very good shooter from long range, can beat opponents off the dribble, and is a very good passer. He shows the ability to distribute the ball and make his teammates better, without turning the ball over very often. Wells also has good quickness and a strong center of gravity. He’s a high IQ player on both ends, and a player that flat out wins basketball games. 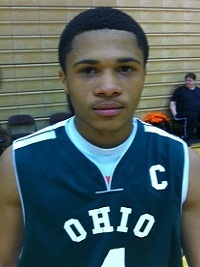 Bottom Line: Size is a concern area but Wells is one of the best basketball talents in the class of 2013 in Ohio. He’s a borderline Division I prospect that could be a under the radar playmaker.